No meaningful progress is being made in NAFTA trade talks between the United States, Canada and Mexico, increasing the odds that President Trump could withdraw from a critical 23-year old agreement. After Round 5 of NAFTA talks ended Tuesday — only two more are scheduled — no progress has been made on divisive issues. "While we have made progress on some of our efforts to modernize NAFTA, I remain concerned about the lack of headway," U.S. Trade Representative Robert Lighthizer said in a statement. "We have seen no evidence that Canada or Mexico are willing to seriously engage on provisions that will lead to a rebalanced agreement." Canadian Foreign Minister Chrystia Freeland said the U.S. put forward "extreme proposals" that "we simply cannot agree to." "Some of the proposals that we have heard would not only be harmful for Canada but would be harmful for the U.S. as well," Freeland added, citing concerns from U.S. and Canadian auto companies. Mexico's Economy Ministry didn't immediately provide a comment at the end of talks on Tuesday, though Secretary Ildefonso Guajardo had criticized the Trump administration's proposals before. Trump blames NAFTA for the loss of hundreds of thousands of American jobs, particularly manufacturing jobs, and a growing trade deficit with Mexico of about $60 billion last year. America has a small trade surplus with Canada. Nonpartisan congressional research concluded this year that NAFTA did not trigger a mass exodus of Rust Belt jobs. Trade economists say automation and advanced technology have eliminated millions more jobs. The U.S. Chamber of Commerce says 14 million American jobs depend on trade with Canada and Mexico, which has boomed since NAFTA became law in 1994. All three sides can't agree on a few key issues. Top of the list: The manufacturing of cars. Automobiles make up the vast majority of the U.S. trade deficit with Mexico, so the Trump administration wants to rewrite the rule book on how and where cars are made in North America. Canada and Mexico say the U.S. proposal on the so-called rules of origin is unacceptable. Another key issue: The agreement's actual existence. The Trump administration has proposed a "sunset clause," which means the deal would end every five years unless all three sides agree to renew for another five. 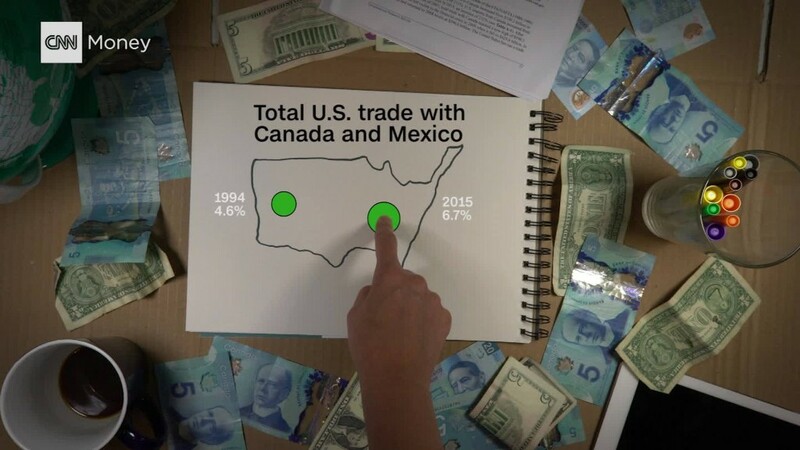 Mexico countered with a proposal that all sides be forced to examine the costs and benefits of NAFTA every five years, though leaving an automatic withdrawal off the table. That's not all. The U.S. and Canada have renewed a decades long fight over Canadian lumber exported to the United States. The Trump administration slapped tariffs as high as 18% on Canadian lumber. The two nations are also arguing over an aviation dispute involving American plane maker Boeing and its Canadian competitor, Bombardier. The Trump administration recently defeated Mexico in a yearslong battle over Mexican tuna exports to the United States. If those disagreements and trade battles persist, Trump may resurface his threat to tear up NAFTA. Economists, and even Guajardo, say it's unlikely Trump would actually withdraw in the coming weeks because many congressional Republicans support NAFTA. Trump needs them to pass tax reform. All three sides say they will meet intermittently in Washington in December, but the next full round of negotiations isn't scheduled until January 23-28 in Montreal, Canada.